Proprietary Name: Rite Aid Sensitive Rapid Protection What is the Proprietary Name? Non-Proprietary Name: Stannous Fluoride What is the Non-Proprietary Name? Rite Aid Sensitive Rapid Protection with NDC 11822-6031 is a a human over the counter drug product labeled by Rite Aid. 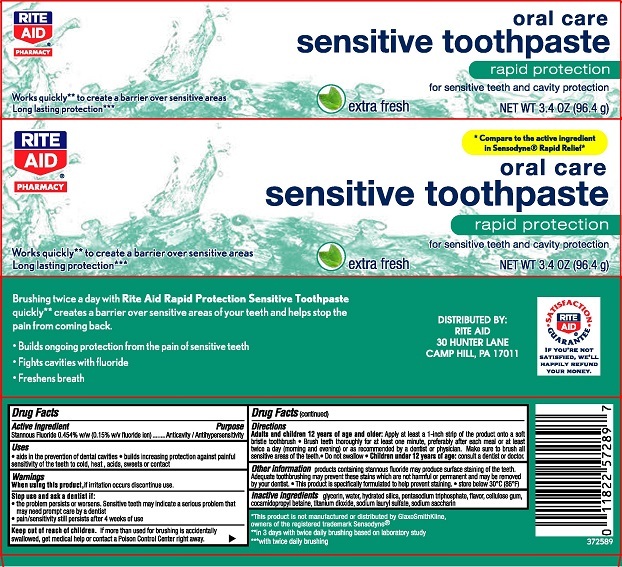 The generic name of Rite Aid Sensitive Rapid Protection is stannous fluoride. The product's dosage form is paste, dentifrice and is administered via dental form. Dosage Form: Paste, Dentifrice - A paste formulation intended to clean and/or polish the teeth, and which may contain certain additional agents. FDA Application Number: part356 What is the FDA Application Number? Start Marketing Date: 03-03-2019 What is the Start Marketing Date? DirectionsAdults and children 12 years of age and older: Apply at least a 1-inch strip of the product onto a soft bristle toothbrush. Brush teeth thoroughly for at least one minute, preferably after each meal or at least twice a day (morning and evening) or as recommended by a dentist or physican.Make sure to brush all sensitive areas of the teeth.Do not swallowChildren under 12 years of age: consult a dentist or doctor.